Touted as “a gem in the Garden Route’s crown”, Gourikwa is a unique and private nature reserve perfectly positioned along 5km of unspoiled coastline. Modern seaside accommodation, together with a variety of indigenous wildlife and flora as well as top-notch facilities help to bring a unique safari lodge experience to life. Choose from three different kinds of self-catering options, namely the Cottages, Fisherman Houses and the Single Villa Rooms, each with a distinct beach influence when it comes to the décor and finishes. The recently refurbished Cottages are less than 100m from the shore which means that each night you’re lulled to sleep by the soothing sounds of the waves. Spacious double rooms provide a comfortable and easy stay. The more rustic, free-standing Fisherman Houses each has its own charm. Spread along the coast, they offer stunning sea and lighthouse views and sleep four to six people. Cosy fireplaces keep you warm in the winter, while the spacious patios provide the ideal place to relax and catch a sunset while preparing dinner. 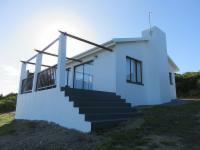 Both the Cottages and Fisherman Houses have fully equipped kitchenettes and built-in braai areas. The five SingleVilla Rooms each has a bedroom, open-plan living area, kitchen facilities, patio and coffee station, along with DStv and WiFi. A mobile braai is also available for use. The Adventure Centre (launching mid 2017) will offer a fantastic learning and teambuilding platform for large groups (especially scholars) who can only benefit from learning about the heritage of the reserve and what is done to protect it. Facilities will include accommodation, tennis courts, swimming pool, bird and whale watching, and game viewing opportunities. Monica’s Chapel overlooks the ocean and provides a beautiful setting for wedding ceremonies. The new banquet hall accommodates up to 200 guests for festivities. The modern, air-conditioned Conference Centre can facilitate up to 50 delegates looking for the ideal place to hold conferences, training and team-building events. Gourikwa Reserve is the perfect place to experience a true escape for a weekend or longer - the natural beauty and refreshing sea air will rejuvenate and revive. Follow the N2 towards Mosselbay. Turn right at the Gouritz turn-off. Follow the road for 44 minutes. Turn right at the Still Bay sign. Travel until you see the reserve gate on your left.